For those of you not familiar with the story behind the X Movie, here you will find a brief synopsis. Kamui Shirou was raised for the first six years of his life in Tokyo. There, no one would play with him as he did not know his father; no one, that is, except for the Monou children-Fuuma and Kotori. Of course, he grew very close to these two; he saw Fuuma as an older brother and dear friend and Kotori as a childhood beloved. One day, his mother told him they'd both have to flee Tokyo. She told him that Kotori and Fuuma's mother had died for their sake and, if he didn't want any harm to befall the Monou children, they'd have to go immediately. 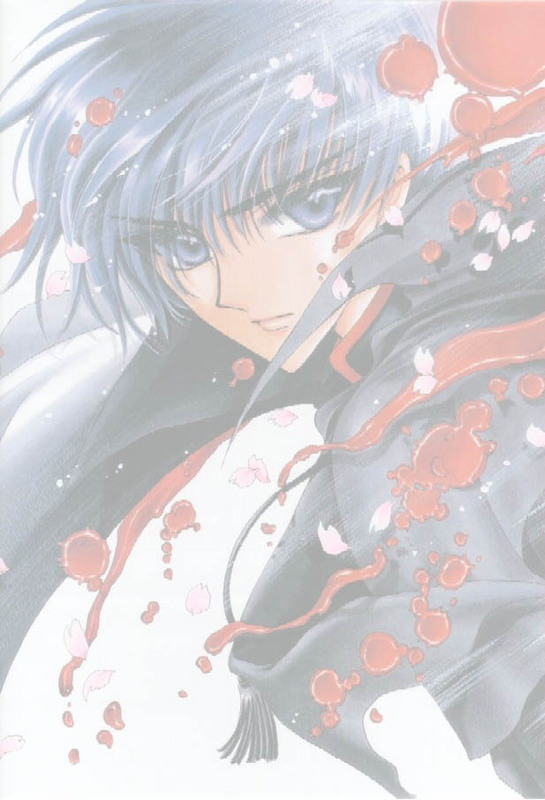 Before leaving, Fuuma extracted a promise from Kamui in return for one of his own: Fuuma said he would protect Kamui as long as Kamui would protect Kotori. They both agreed and Kamui left with his mother. Ten years later as they sat beneath a flowering cherry tree, Kamui's mother asked Kamui if he has anything that he would like to protect. He immediately answered that he wants to protect Kotori and Fuuma...and her, of course. She laughed and said that it was sweet for him to want to protect her, but it is her fate to die. Kamui reacted badly, but his mother merely asked him to be strong in order to protect that which he loves. Shortly after that, Kamui witnessed something rather terrible. After removing the 'Sacred Sword' from her body, Kamui's mother commanded him to return to Tokyo then died in a bloody explosion. Kamui did as she asked. He returned to Tokyo in time to witness the first fight of the Dragons of Heaven and Earth. Afterward, a strange man half in shadow warned him that the battle has just begun. Predictably, Kamui returned to the old Monou Shrine just in time to save the two Monou children from some spooky possessed wires. Upon meeting Fuuma's eyes, however, both men fall to a geneflect and see an odd vision of themselves charging the other, both with white feathered wings and brandishing odd swords. Recovering, the Monou children both happily greet their long lost friend. Fuuma reminds Kamui of the promise they had made the day Kamui left. It begins to rain. Kotori lifts a hand in order to catch a droplet and it cuts her hand. Kamui orders Fuuma to look after Kotori. A battle ensues, first between Kamui and Nataku and Asagi Shougo then between Nataku, Asagi, Kamui, Arashi, Sorata, Yuzuriha, Karen, and Aoki. During the scuffle, Kotori is kidnapped by Kanoe (a dream-seer and 'leader' of the Dragons of Earth). Fuuma follows and stumbles upon Kanoe, who comes to recognize him as Kamui's 'twin star' From here on in, Fuuma slowly comes to believe that he -is- Kamui. Hinoto gives Kamui a vision of the future in which he kills Kotori. Kamui balks at this and goes off on his own, ultimately returning to the Monou Shrine. There he falls asleep and, in his dream, hears Kotori calling for him. He follows the voice to her room and opens the door. He sees Kotori sleeping, suspended in an odd liquid. She whispers that the product of her love for Kamui growing in her will soon be born. He reaches out for her and an explosion rocks him backward. He wakes and, eventually, returns to the Dragons of Heaven. More fighting. Karen fights in the subway and manages to kill Asagi; unfortunately, she dies as well. Aoki takes on Nataku and kills them both when he throws himself and Nataku from the top of a building. Arashi and Sorata eventually meet up with Fuuma, who has now come to believe he is Kamui. They fight. Yuzuriha and Kamui come upon Kusanagi Shiyuu in the streets. They fight. Yuuto Kigai eventually joins in. Yuzuriha is killed defending a distracted (or too slow) Kamui. Fuuma 'warps' to the place where Kamui is, leaving both Sora and Arashi alive. Fuuma kills Kusanagi for really no good reason then is about to kill Kamui when Hinoto saves him by warping him to her sanctuary. Fuuma returns to the meeting place of the Dragons of Earth and kills Yuuto. Satsuki dies trying to get her Beast to help Yuuto ('Satsuki is mine. I will give her to no one.') Fuuma then goes to where Kotori is sleeping. She wakes to see her older brother. He mentions the product of her love for Kamui. She tries to run away, realizing something is wrong. Kamui, still at Hinoto's, calls out for Kotori and reaches out his hand. A vision of Kotori breaks through one of the walls and is about to take Kamui's hand when Fuuma grabs her from behind, then extracts a Sacred Sword from her, killing her. Kamui weeps over the body of his dead beloved as Fuuma once more appears, this time with Kanoe as hostage. He throws Kanoe foreward then stabs her through. The wounded woman crawls to Hinoto, her older sister. Sora and Arashi go outside in order to fight Fuuma. Sora is killed trying to shield Arashi and Arashi is killed as she kneel beside Sora's dead form. Kanoe reveals that her reason for doing all that she had done was because she wanted to free her sister from her role as dream-seer for the government. If she (Hinoto) could be free....nothing else would matter. Crying, Hinoto sends Kamui to the Tokyo Tower for the final battle. Fuuma and Kamui face off. Kamui refuses to fight, but Fuuma keeps insisting that it is fate. Kamui inserts that true fate is something that is chosen. Fuuma charges Kamui, sword at ready. Kamui calls forth his Sword and charges Fuuma. Both men fall to the ground. Kamui's Sword had shorn through that of Fuuma and the shard cut through his neck, beheading him. Kamui kneels with Fuuma's head cradled in his arms. He cries freely. When asked why, Fuuma's voice reminds Kamui of the promise they had made. He states that he had protected Kamui, just as he promised he would. Ok, if that was too vague, the general idea of the story is that Tokyo is protected by six barriers and these barriers are protected by six young people with incredible powers. Each time a barrier falls, that area will be erased from the earth in some sort of natural disaster. So? That's just bad for Tokyo, right? Wrong. Once all the barriers fall, the world is doomed.